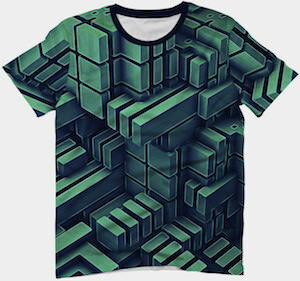 Now you can have a t-shirt that has an amazing green blocks all over it and that looks amazing. The shirt has the design that both takes up the front and the back and even the sleeves are covered. The blocky shirt is available in styles for men and women and come in sizes Small – 3XL and is made from 100% polyester. It looks like an amazing shirt thanks to those green squares and I am sure you are going to love wearing the shirt and it goes well with many outfits.